This photo to the left is not a personal reflection of religion...my life has meaning in every nook & cranny and that's before we even can start talking about religion. Although, I see TONS of people who only have a religion because they feel it does give them meaning...I begin to wonder just how they would manage if they didn't have that to ground them and if they REALLY believe and/or know what their religion is about. Which is exactly what this blog is about today. We all have our various beliefs, whether they stem from religion or personal preference. However, nothing makes me stare in confused amazement at another person who comes across and wants to be portrayed as being "religious" and they know so little about their own religion. Who are you and why are you even claiming a religion? Shouldn't you know more than some hymns you sing in church if you supposedly LIVE in church? Then it becomes painfully and obviously clear that some people have a religion simply to say, "I am (insert religion here)". When I was younger, I picked up this book called Mankind's Search for God. It touched on various religions and their backgrounds, where they derived from, what were some of the beliefs (to date), and so and so forth. That book alone piqued my curiosity SO much that I developed a natural interest in other people's religions. Not because I wanted to practice anything different than what I had been raised to be. It intrigued me that there were SO many different ways people had found to worship ONE almighty diety and despite their purpose ALL being the same (to worship God/a god), they can NEVER manage to get along because of the doctrines attached to their worship of God. I began to study people who "claimed" they loved the Lord and who were Christians. I was raised to be a Jehovah Witness and contrary to ANYTHING someone else who isn't a Jehovah Witness has told you, yes, they can be classified as Christians. I figured I would start in my own backyard before branching out. I had already read the Bible several times when I was younger but every year, I would read it again because my interpretation of it ALWAYS seemed to change as I got older. I understood better and things that were too much for my young mind to grasp became clear as day. I would hear people quote scriptures and IMMEADIATELY know they were misquoting something to serve their sordid purpose. I took personal offense to ANYONE (not just Jehovah Witnesses) that "claimed" to be a Christian but had NEVER read the Bible in it's entirety. To me, it was disrespectful...you believe in something that you haven't studied and analyzed to really know anything about. Christian beliefs are based on EVERYTHING that is in the Bible, yet most people never even pick it up. It was no different than someone who "claimed" to be Islamic but never read the Koran...(again this is my opinion but...) you're a disgrace to your religion because you don't even know about the things your religion stands for. So after learning a plethora of knowledge about Jehovah Witnesses, Catholics, Baptists, and any other religion that could be categorized as "Christian", I set out to educate myself on other sectors of religion. Buddhism, Scientology, Islam, Hinduism, Judiasm, even religions that did ABSOLUTELY ludicrous things. I just wanted to understand what the big deal was that EVERYONE had to have a different religion. That is when it clicked...people either choose their religions based on the lifestyles that are accomodating to them, stick to what they were raised doing, or choose what requires the least amount of effort. Even though I grew up a Jehovah Witness, my father still had other publications from different religions around so that he (as well as us kids) could never be in the dark when discussing someone elses religion. There are plenty of tools to understand WHY people do things based on their religion...all you gotta do is open one and read it. So there were different translations of the Bible on our shelves, as well as, the Koran, and other books. Anytime I've ever approached someone seeking information about their religion, it didn't matter HOW MUCH I knew already, I still questioned them as if I was a novice. I never assumed I knew it all about someone elses religion because that also is rude as hell. Nothing makes my pimp hand itch more than when someone proudly tries to tell me, "Oh, you people don't even believe in Jesus". It would serve them better to ASK, "Do Jehovah's Witnesses believe in Jesus" versus assuming we don't. I've heard it all..."well if you did, why isn't your religion called Jesus Witnesses"..."you don't believe in Jesus because you call God, Jehovah"..."who is Jehovah? yall made that up"...the list goes on. Ignorance is vile and disgusting to me when it's blatantly obvious that it isn't really a person being ignorant...you just want to be stupid and perpetuate things you heard, rather than opening your mouth and asking. I am more spiritual than religious, but I know a little about being a Christian also. 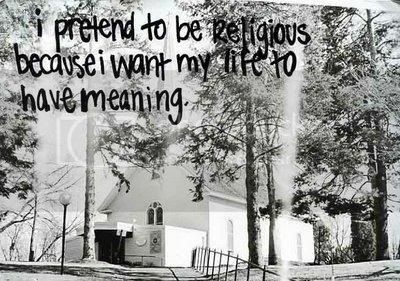 The thing about me is I would never pretend to be all knowing about religions, either Christian or any of the others. I am a novice at best, and am the first to admit that in any conversation I might have with somebody. I'm with you on this one, I have read parts of the Bible, but I haven't read it from cover to cover. That being said, I realize that if I haven't read the whole thing, I can't really know all about what it says no can I! I don't like the types that claim to know it all, when in fact they know little or nothing about a subject. It is annoying I would say. The thing that bothers me even more though, is how everyone seems to have their own interpritation of the religious material. There is so many different interpretations that sometimes it is impossible to know what is really being said. Wow, very, very enlightening post.I was raised one as well (No wonder). Question is, is it human nature (natural) for people to want only what they want in religion, or is it in fact un-natural, a detachment, a curveball somewhere in the human path? I believe in God and I say I'm Christian sometimes, but honestly...I don't even know if I could say that much. I've been meaning to pick up a bible of my own forever. I don't rep well for the Baptists at all. LOL I can't even remember the last time I went to church. It's interesting you talked about people quoting the bible. I never believe what they say because I've never read much of the Bible to be sure and people always interpret scripture differently...sometimes just to serve whatever purpose they have. Yep, I know where you're coming from. My dad was a pastor and he taught my siblings and I to know WHY we believe what we believe and that included studying other religions and the differences that exist within them all. I love learning about other people's beliefs and it's helped me have some interest conversations with all kinds of people. This post definitely speaks to me. I've always found religion to be an interesting topic and like yourself I've never been afraid to ask around about different beliefs and read what texts I can here & there. On a related matter, Bill Maher has a documentary called "Religulous" you might enjoy checking out. It's preety eye-opening and thought-provoking. Solomon: I've read the Bible from cover to cover 6 times...the 7th time, I got interrupted with life but I plan on finishing that goal sometime soon. After reading it 6 times through and through, it's almost like I have formed a sort of radar when people are misquoting it and it irritates the life out of me. It's like someone singing a song you know verbatim and then trying to tell you that these REALLY are the words...no they aren't, moron.